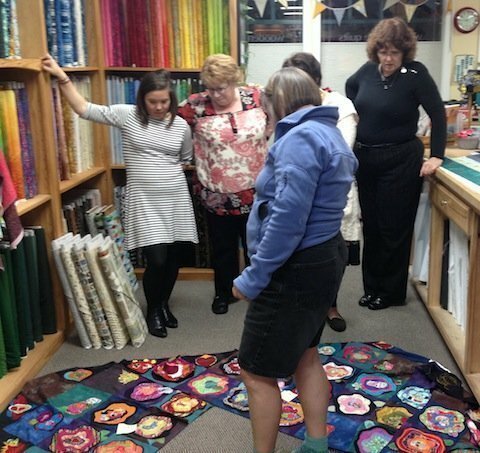 And we decided to make a birthday quilt for our friend, mentor and teacher Margaret Linderman. 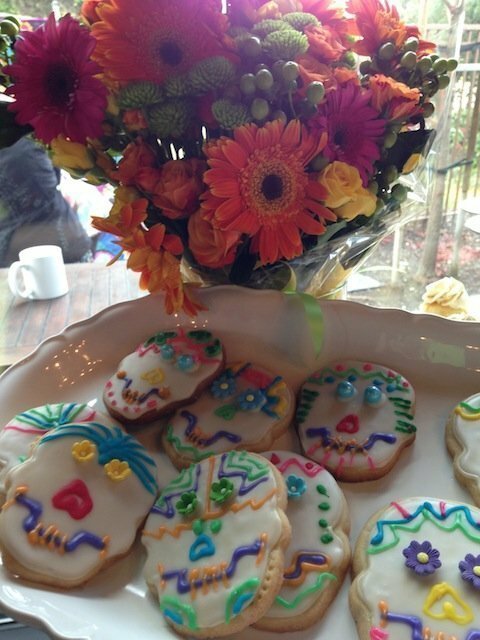 And we decided to make it a surprise! And we wanted all of her peeps to be able to create a part of the quilt. 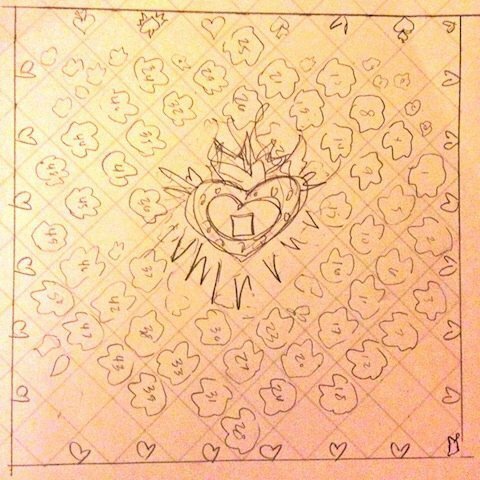 I thought of the French Roses quilt, created by Heather French. It is a versatile, layered, fabric flower that Margaret and her students have made many times for many people. 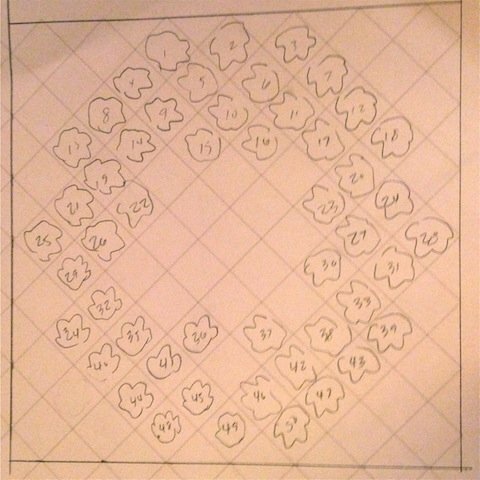 I drew up a layout with the blocks on point that would have 50 flowers – enough to include many friends! 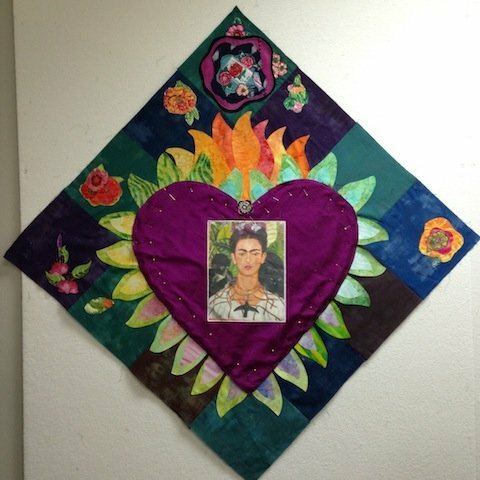 Then I added in a center that could have an image of Margaret’s muse, Frida Kahlo, in a flaming corazon. Margaret’s daughter Janis Stob and I sent out packets of background fabric, a black shadow for each flower (to add a visual punch) and inspiration appliques. It will surprise none of you that I have quite a collection of Alexander Henry fabrics from which to draw folklorico inspiration! 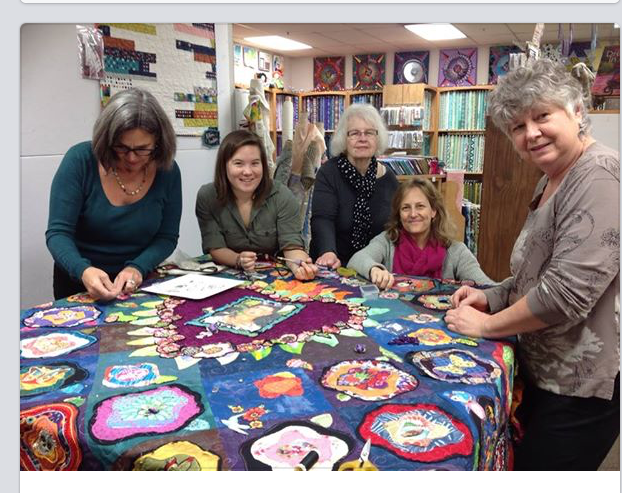 When the blocks came in we gathered at Wooden Gate Quilts, in Danville, and worked on a layout. 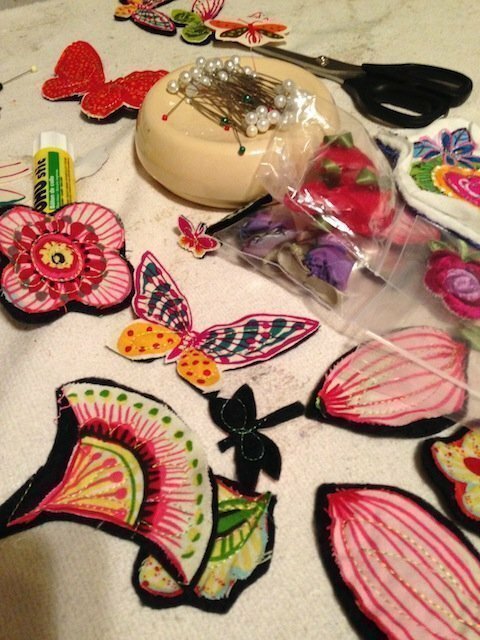 Janis sewed the blocks all together, making many extra where we needed more, leaving the hole in the middle for Frida. 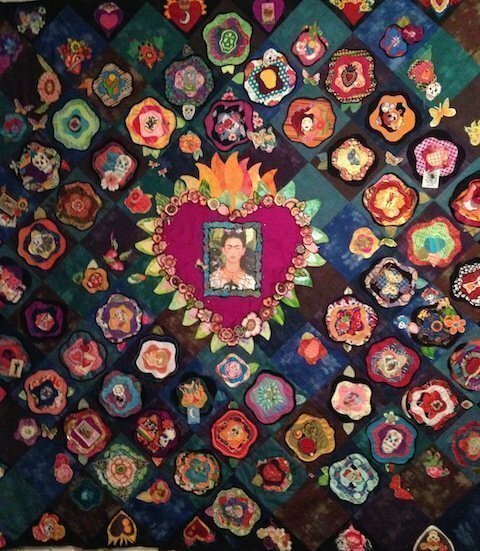 I created a heart from dupioni silk and cut flames out of bright batiks. 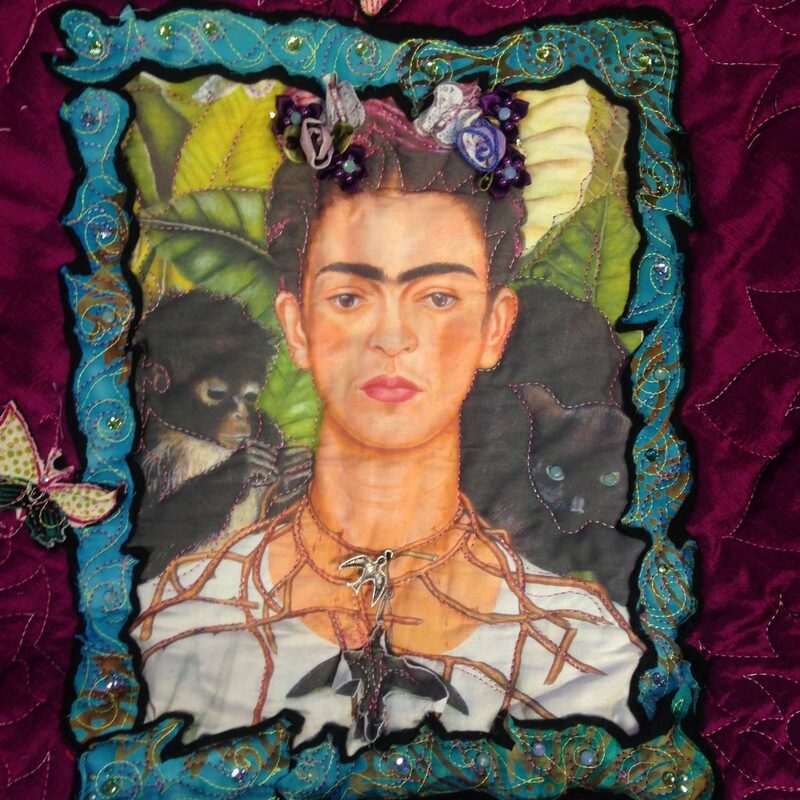 Margaret’s favorite image of Frida Kahlo was printed on to fabric to adorn the center. To make an exciting edge to the heart I glued lots of small flower appliques to a layer of black batting which would add dimension, color and texture. I stitched them all on the longarm and cut them out with the black shadows visible. 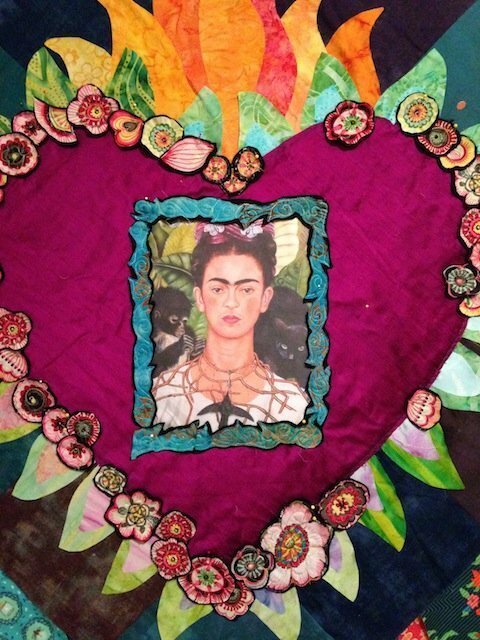 The appliques surrounded the corazon and then I created a frame for the photo of Frida. 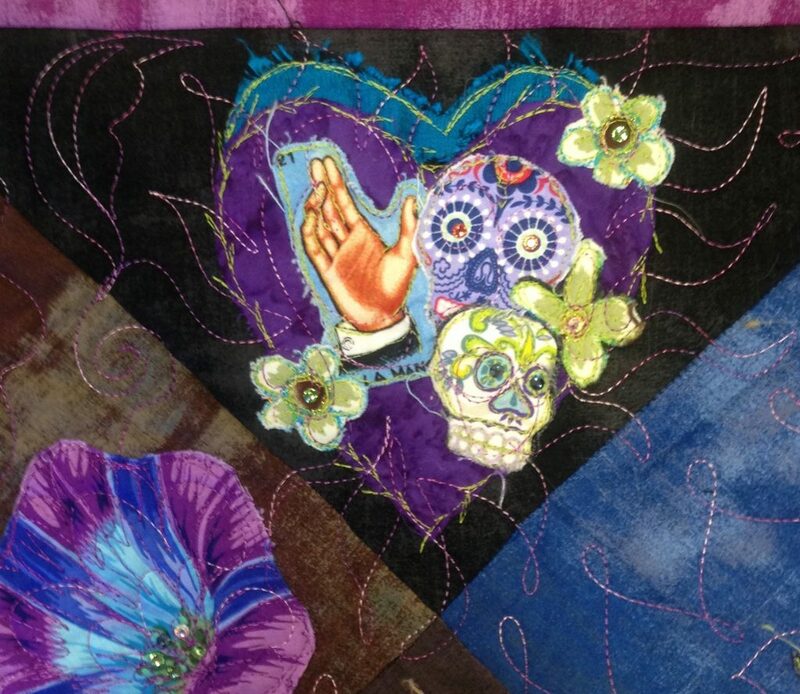 The outer “border” was composed of more corazons, most made by Janis Stob and Kathy August. The quilt began to take shape! Of course, even though we started MONTHS in advance, the quilt didn’t get on to the longarm until the DAY BEFORE THE PARTY. And we still had to add bling and bind it! I had a marathon 6 hours on the longarm to get it all quilted! That night we had a bling and binding party! You won’t believe how fast Pat DeForce got that binding on for us! The next day we threw her a surprise party! 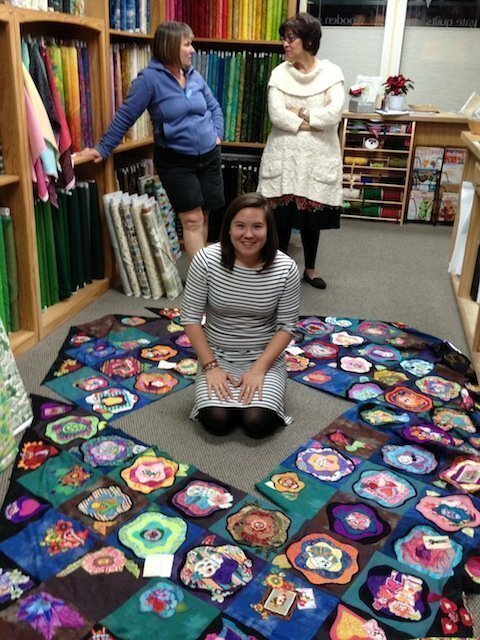 Please hold for Part 2, wherein we give Margaret the quilt! 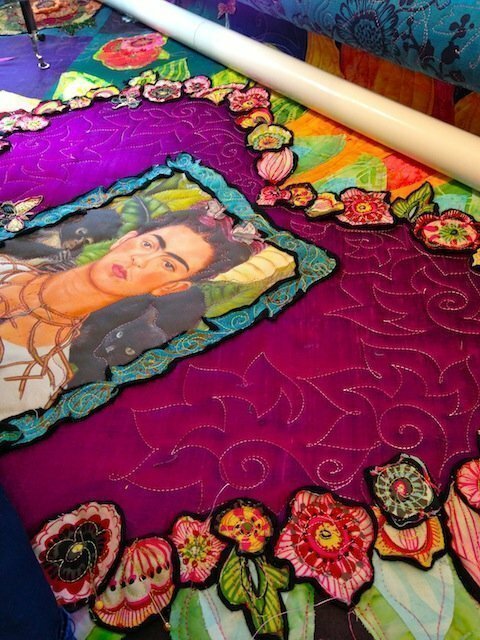 Look for our quilt at Pacific International Quilt Festival in Santa Clara, California, this weekend! Streak of Lightning Quilt – Make one today! There had to be some tears of joy shed. I’m feeling it. By the way, in one of the photos that you’re in I can sure see Viola plain as day. I see where she gets her gorgeousness. Yes, a few tears! I captured a bit on camera. Will try to include a video in Part 2! Thank you for the compliment! But Viola’s beauty must come from your side of the family!!! 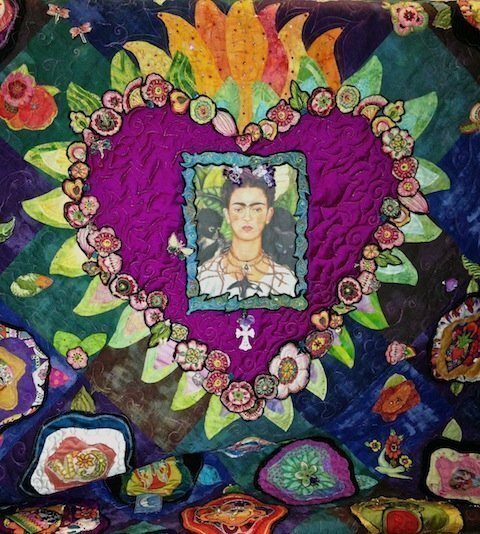 This is one of the coolest quilts I have ever seen! This was the second quilt I saw today, and the second one I photographed. The first, of course, was right beside it–yours also, all clocks and furniture and peonies and skylines. I love them both– thanks for sending them in.